The organisers of the 2014 Commonwealth Games in Glasgow has blamed TalkTalk Business for an error that meant people who received an engaged tone on ticketing phonelines were charged for the call. 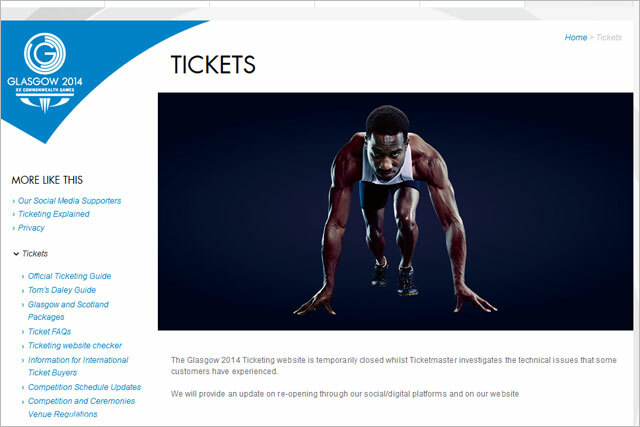 Glasgow 2014 organisers have apologised "unreservedly" for the mistake and are working with Ticketmaster, which uses TalkTalk as a supplier, to refund customers "as soon as possible". A spokesperson for TalkTalk has attributed the mistake to a "human programming error" and admitted it did not deliver the service it had agreed with ticketing provider Ticketmaster during the general ticket sales. The long waits to get through to the ticketing hotline have meant some callers have been charged more than £100 for their calls, according to a report in the Scotsman. The mistake is the latest in a litany of errors plaguing the sales of Glasgow 2014 tickets, which the organiser has admitted could take days to resolve. Online sales for 100,000 tickets released on Monday were eventually halted at 6pm on Tuesday, after long delays and problems completing transactions. Public frustration with the ticketing process has led to an outpouring of anger on social media sites, as people complain about the problems they have encountered.